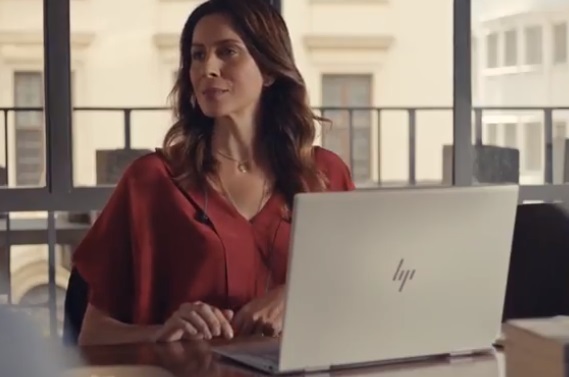 HP advertises its Envy x360 laptop as “the only laptop with a built-in privacy screen” in a new commercial, highlighting that it allows you to decide what to share and when. The 30-second spot features a woman in a meeting room, having a videocall with her husband and son. As her colleagues join her, taking their seats near her, she has the intention – for a moment – to end the call with her kid, but after a second thought, she decides to use the built-in privacy screen and keep talking with the boy for a little while, before the meeting begins. Thus, even though someone is sneaking a peek at her screen, they can’t actually see anything. The ad, scored by a catchy tune, ends with the brand’s tagline, “keep reinventing”. HP now gives you the chance to save up to 50% of printers and All-in-Ones and get free shipping and returns as part of its weekly deals. Its 2-in-1 laptops, which offer the functionality of a traditional laptop with the portability of a tablet, are now starting at $249.99 and the items included in the All-in-One range are starting at only $369.99.